*Tune In / ATAR598 / NCYC 2009 God has laid a feasting table / Invitation (Whelan). Feminine imagery of God gathering her guests to a feasting table. Fun Cuban rhythm. Sample and songbook. NCH057 / VU379 / WoV688 / LBW459 / ELW399 / SFFS 2121 / CP(E) 188 / Cha251 / URW079 / VF055 O Holy Spirit root of life (Jean Janzen) Good words of "Holy Spirit","Eternal Vigour" and "Holy Wisdom". I like the phrase "encompass us with wings unfurled". Simple known tune (PUER NOBIS). Lyrics. New words to old tunes. *TiS 418 / AoV2-075 / Iona (EoA, Common Ground) / CH593 / GA372 / A&M259 / Cha255 / SP94 / URW165 / StF393 / Lau305 She sits like a bird brooding on the waters (Bell) My favourite Holy Spirit song. Beautiful words and very easy to sing, provided it is not played too quickly The Iona recordings are generally very quick, but there are a lot of words to fit in, so keep it elegantly moderate in speed! Lyrics (scroll down). *VU379 / WoV688 / LBW459 / ELW786 / SFFS 2121 / Cha251 / URW079 O Holy Spirit root of life (Janzen, based on Hildegard) Good words of "Holy Spirit","Eternal Vigour" and "Holy Wisdom". I like the phrase "encompass us with wings unfurled". Simple known tune (PUER NOBIS). New words to old tunes. *MV010 / GtG174 / URW099 / VF060 Come and seek the ways of wisdom (Duck) This song is more about the personification of Wisdom, but would work very well as a gathering song in the context of this reading. The tune in MV and GtG is a joyful 6/8 tune, but not familiar, so if it seems difficult, you could sing the same words to PICARDY (TiS 497). VF has a more challenging tune, which may be a bit tricky for a congregation. Lyrics. MV 145 / CP418 / SP&P123 Draw the circle wide (Light) A great song about welcoming all people. Chorus is “Draw the circle wide, draw it wider still. Let this be our song, no-one stands alone, standing side by side, draw the circle wide”. *CH604 Holy wisdom lamp of learning (Duck) Great words seeking wisdom, judgement, and celebrating a searching faith. Sung to a good joyful and easy hymn tune (IN BABILONE). Could also be sung to BEACH SPRING. New words to old tunes. *GA183 Come Holy Spirit, the spirit of Wisdom (Willcock) Good song. It's in 7/8 so you can't go wrong. The words are also excellent about God-with-us and the coming of the Spirit. This is also in New Song in an Ancient Land Vol 1 (in the Liturgy Library at BUC). *VU892 / CP392 / Cha258 Who comes from God as word and breath, Holy Wisdom (Michaels) Solid words about the place of wisdom in the Godhead. "Who lifts her voice for all to hear? Joyful Wisdom.Who shapes a thought and makes it clear? Truthful Wisdom: Teacher, drawing out our best, magnifies what we invest, names our truth, directs our quest. Wisest one, radiant one, welcome, holy Wisdom!". Lyrics and tune sample. *URW206 In her house there is a table / Wisdom's Table (Gay) Sung to BEACH SPRING, this song has great words of being welcomed by Wisdom at her table through times of trouble. New words to old tunes. *MV063 / StJ / GC(II)500 / G(3)583 Long before my journey’s start / Wisdom my road (Warner) Song for Wisdom. Pretty straightforward. NCH033 / UMH151 / VU251 / ELW738 / PH290 God created heaven and earth (Taiwanese) Excellent words of creation, sung to a Pi-po (Taiwanese) melody. It will need to be taught, but it is not too hard. 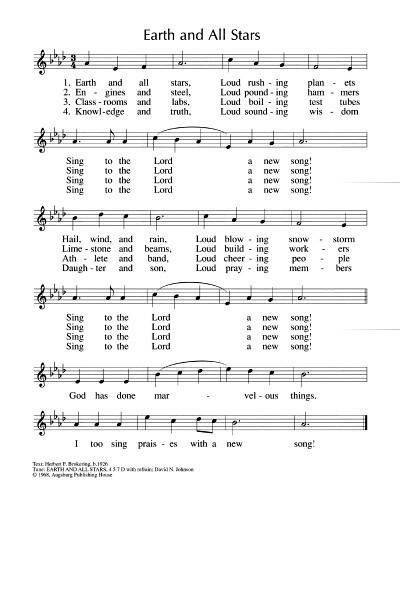 GtG017 Sing praise to God you heavens (Stuempfle) A fairly standard paraphrase of the Psalm. I just love the singing planets, and the mountains thrusting skywards. Ah, it's a good'un. Oh, and the sheep. I like those singing sheep. CH174 / GtG019 God of great and God of small (Sleeth) Nice simple, children's song. Might work well with a cantor and response on the chorus. Kids could then sing it without having to read lots of words. Good for kids. ATW 422 / NCYC'99 And you sun and moon and stars (Canticle of Daniel) (Stewart) This is a big favourite in our congregation. It has wonderful energy and excellent lyrics. *URW097 All you works of God bless the Lord (Starke) Joyful words of creation's celebration to the Jamaican tune LINSTEAD (Let us talents and tongues employ). Fun! New words to old tunes. 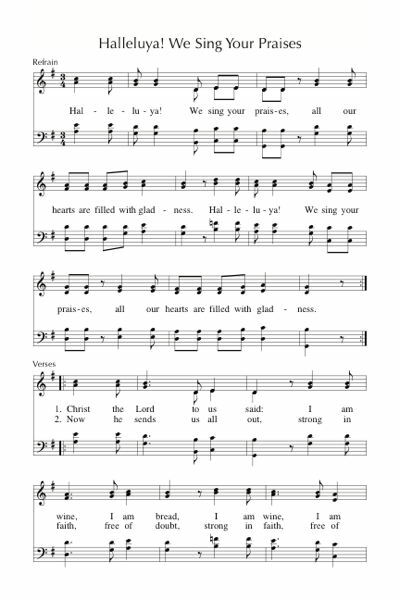 TiS 187 / AoV2-130 / CH149 / StS122 / A&M539 / SP247 Let all creation dance I just love the imagery of this one, and it's a very joyous and familiar hymn tune too. Lyrics (downloads pdf). 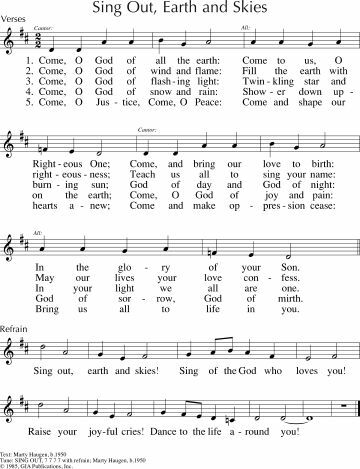 TiS 181 / AoV2-032 / GC(II)497 / G(3)577 / CP589 Come O God of all the earth / Sing Out Earth and Skies (Haugen) A very joyful song for cantor and congregation, or small group and congregation; this is a big favourite in our church. Sheet music, lyrics and sound sample. AoV1-019 / CH151 / GA397 / G(II)340 / GC493 / GC(II)498 / G(3)575 / W&R039 All You Works of God (Haugen) Joyful cantor and response. If your musicians have any energy left after Christmas, they might enjoy playing with this. Probably good for kids. Lead sheet and lyrics. Silly sound sample. AoV2-120 / AoVK-9 God Is Good let the sun and moon and stars say "God is Good" (Chan) Fun. Not easy, but probably worth the effort if you feel like learning something new, or giving your musicians a challenge. Good for kids. GtG018 / PfAS148E Hallelujah sing praise to your creator (Lubis) Joyful words set to a traditional Indonesian melody (NYANYIKANLAH NYANYIAN BARU). GtG is more inclusive than PfAS. TiS 755 / ATA 196 / CH804 / VU884 / SFFS 2278 / A&M484 / HPP219 / GTG080 / CP772 / W&R710 / SP82 / Srcs830 / URW449 / Lau878 / STF487 / MP796 You shall go out with joy / The trees of the field (Dauerman) This is a good hand clappy foot stomping song. Fun. Good for kids. Some nice Christology “image of the invisible God, first-born of creation…. all things created through him and in him”. *W&R104 / URW102 Hidden Christ Alive for Ever (Wren) Wonderful and inspiring words of Christ in all things. Can be sung to HYFRYDOL or HOLY MANNA, so would be easily sung by most congregations. A good song for just after the sermon. Sheet music. New words to old tunes. TiS 157 / AHB 103 / CH246 / A&M547 / PH297 / CP411 / CP(E) 263 O Lord of every shining constellation / Great God of every shining constellation (Bayly) Great words; the tune in the Australian hymnals (NORTHBROOK) is a little tricky. Note that AHB is masculine for all people, so look up other sources for inclusive language. *TiS 688 Come to be our hope O Jesus (Marachin) This is a really fun Latin American song from the World Council of Churches Assembly in Canberra. It's not easy the first time, but once you've heard it, it's very catchy. The words are really excellent, despite a slightly clunky translation. It would be worth teaching to your congregation! We sang this a couple of times during Advent. Brunswick Song Project: Love is the Power (Anderson). Suggestion for the congregation at Brunswick as this is not published yet, but it is in our church folders. It’s a while since we've sung it, but it went down well last time. It's a little bit tricky. AA036 Every day I will offer you (Murray) “Everyday, in your Spirit, I’ll find the love and energy”… Good song of commitment. Might be good as closing song. This is also in other books of songs by Shirley Murray. Lyrics & Sheet Music. TiS 617 / NCH413 / UMH517 / WoV736 / ELW626 / A&M605 / GtG818 / PH342 / W&R75 / 82Hml-695 / Lau428 By gracious powers so wonderfully sheltered (Bonhoeffer / Pratt Green) Wonderful words by Bonhoeffer. Lousy tune. Words fit well to O Perfect Love if you find the tune too tricky. Can also be sung to BERLIN or INTERCESSOR. The 5th verse is omitted in some hymnals. Lyrics. TiS 691 Faith will not grow from words alone (Smith) Excellent strong words of a questioning faith to a familiar hymn tune. New words to old tunes. Jesus as the bread of life. 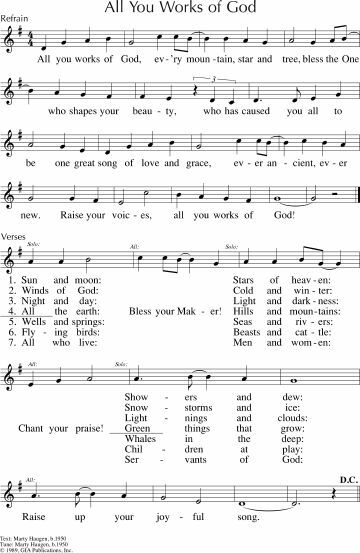 *New Brunswick UC songs In Spirit we rise (Anderson) It would be great to sing this song about God's spirit working in and through us. "In Spirit we rise, rise, rise, to be bread for the world". Sorry, this isn't available yet online or in a songbook. Taizé / TiS 714 / AoV1-125 /ATE 270 / CH661 / UMH628 / VU466 / WoV709 / ELW472 / GtG527 / GA205 / A&M442 / G(II)588 / GC838 / GC(II)806 / G(3)941 / RS928 / CP063 / W&R697 / Cha414 / SP229 / URW379 / Lau633 / StF583 Eat this bread drink this cup (Batastini / Taize) Excellent, particularly if you have a capable cantor. Some resources say "Come to him and never be hungry", but others have "come to me / trust in me". *ATW 474 You're like the sun that warms me / Bread of angels (Mann) This is a nice ballad, a favourite of many in our congregation. It may not be easy for a congregation without some introduction because the structure is a little tricky. Lyrics. *TiS474 / AoV1-012 / ATAR595 / CH623 / SFFS 2236 / HPP553 / A&M363 / GtG401 / G(II)539 / GC839 / GC(II)743 / G(3)848 / CP465 / W&R649 / Cha284 / SP175 / URW054 / Lau475 Here in this place new light is streaming / Gather us in (Haugen). Excellent words, very well known. “Nourish us well and teach us to fashion lives that are holy and hearts that are true”. Lyrics, sound samples, sheet music. FFS03 As we walk along beside you (Perry) Excellent words or recognising Christ in the word, the bread, the resurrection. A simple tune. Lyrics. *AoVNG15 Bread of Life (Poirier) A nice gentle song. Would be good for distribution of communion. This was sung by the musicians on Maundy Thursday, and it would be good to sing it again. *TiS 538 / AoV2-093 Feed us now Bread of life (Mann) One of my favourite communion songs. Simple to sing, and beautiful simple theology. “Piece of bread, cup of wine, Lord this food is good”. Lyrics. Good for kids. MV194 Bread of life feed my soul (Spencer) A simple communion prayer for healing and guidance. WoV701 / ELW487 / URW119 What Feast of Love (Dufner) Very poetic devotional language about Christ as the bread, light and wine. Sung to GREENSLEEVES. Maybe better as a solo initially so people can just listen to the beauty of the words. Perhaps sung during distribution of communion. New words to old tunes. ATW 473 / Lau625 Bread for the world a world of hunger (Farrell) Very nice words. Tune a bit schmaltzy, but the words save it. A bit gutsy really. Good for a soloist during distribution of communion. AoV1-027 / AoVK-102 / GA200 / G(II)613 / GC847 / GC(II)807 / G(3)924 / Lau473 We come to share our story / Song of the Body of Christ (Haas) Simple tune and good words "We come to share our story, we come to break the bread, we come to know our rising From the dead". Sung to a traditional Hawai'ian tune. MV197 Bread of life broken and shared (Gagnon) Quite nice verses and catchy chorus, which refers to this, and other famous bread-like readings. For communion. *TiS 541 / CH674 / WoV722 / ELW535 / GtG538 / G(II)394 / GC562 / GC(II)529 / G(3)626 / CP082 / SP&P190 / W&R709 / ZSS198 / URW400 Hallelujah we sing your praises / Haleluyah! Pelo Tsa Rona. Joyous and simple song. "Christ the Lord to us said "I am wine, I am bread. I am wine, I am bread. Give to all who thirst and hunger". Sound sample. Sheet music sample. Good for kids. Online resource Amazing is the Christ who died (Habel) Excellent words to the tune of Amazing Grace. Lyrics (PDF). Do you have some ideas too? Please share them in a comment below.